I didn’t take many photos over the Christmas holiday (I know, scandalous.) We had multiple Christmas celebrations, and my best pictures ended up being of pets. Another shocker, I’m sure. So my favorite holiday photos may not be anything like your favorites. I guess that’s what makes You Capture even more fun! 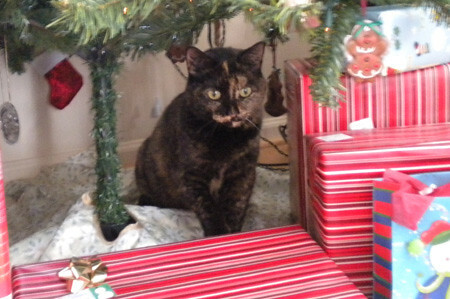 And when she wasn’t in the boxes, she liked to hang out beneath the tree. This look scared me because I didn’t know what she was going to do next. 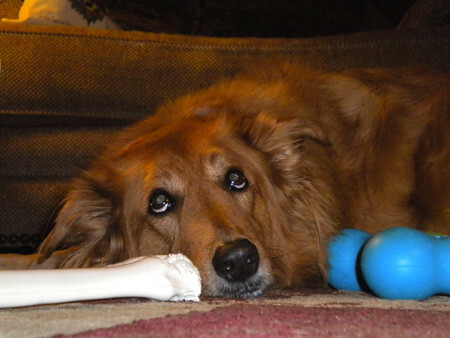 And here’s Sophie with her new blue rubber bone toy – and begging for my husband to pet her. Or play with her. I’m going to go with petting, though, because she’s not big into playing. I think the Sophie picture is my favorite. She’s just SO sweet! My cat loves Christmas! Between the tree that he hides under, the ribbons that he chews on (gross), and the boxes that he sleeps in… he is one HAPPY CAT! Cute photos!!! I LOVE the picture of your dog! How sweet!! Congrats on your 1,111 post! And the picture of Sophie is my favorite too! It is hard to get a lot of great photos from the holidays when you’re smack in the middle of it but your photos were very nice indeed! I want to pet you dog! Awww, great pet shots. 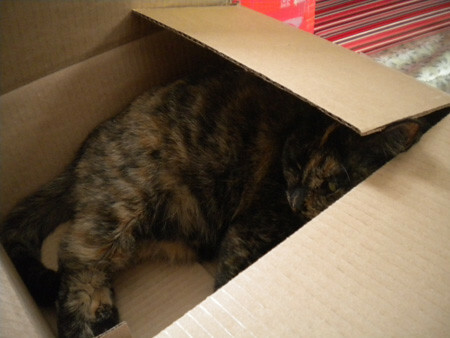 My cats always enjoyed all the wrapping paper and boxes from Christmas morning! Cats and trees — I don’t know what it is. Our new cat pretty much lives under the tree. She can even scale it in a few seconds — and this one doesn’t topple over. She’s in heaven.